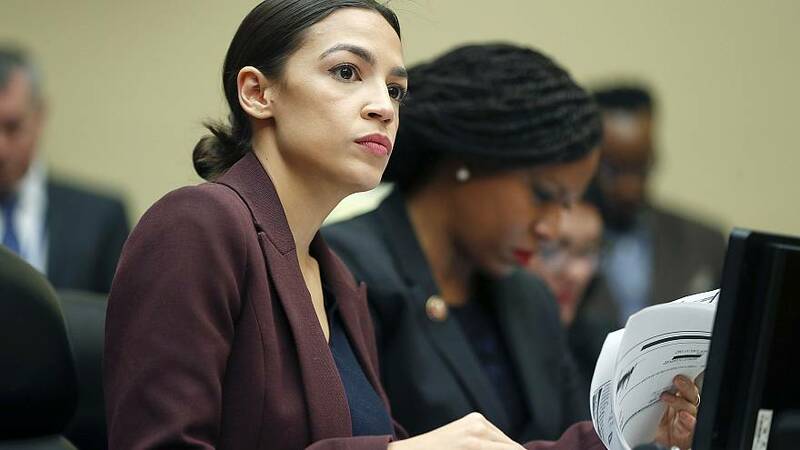 Rep. Alexandria Ocasio-Cortez, D-N.Y., on Friday gave a vigorous defense of her signature Green New Deal initiative, rejecting criticism that it is a socialist policy. The freshman Democrat said she expected to have pushback from Republicans to her resolution, which calls for a complete transition to renewable energy by 2030. "But I didn't expect them to make total fools of themselves," she told MSNBC's Chris Hayes during an "All In" Town Hall at the Albert Einstein Medical Center in the Bronx. "I expected a little more nuance, and I expected a little more concern trolling." Watch this exclusive interview during the special "All-In Green New Deal" tonight at 8 p.m. ET. The measure, which was introduced in the House this past February, is non-binding, meaning it would not have the force of law if passed, and contains a broad set of principles and goals for responding to climate change rather than more specific legislative language on how the process would occur. Senate Majority Leader Mitch McConnell, R-Ky. brought the Green New Deal up in the Senate on Tuesday, where it failed to advance after what Democrats said was a politically-motivated show vote. The bill, which needed 60 votes to clear a procedural hurdle, failed in a 0-57 vote, with 43 Democrats voting present. Ocasio-Cortez argued that the plan is economically and politically feasible if Congress allows hearings on the issue. "We don't have time for five years of a half-baked, watered down position," she said. "This is urgent, and to think that we have time is such a privileged and removed-from-reality attitude that we cannot tolerate." She said that her mission is to use the initiative to spark a conversation beyond Washington about how to address climate change and harness the American economy to dramatically reduce the effects of global warming as the nation did during the Great Depression and World War II. "The entire United States government knew that climate change was real and human-caused in 1989 - the year I was born. So, the initial response was to let markets handle it, they will do it," she said. "Forty years of free-market solutions have not changed our position. So this does not mean that we change our entire structure of government, but what it means is we need to do something. Something!" She said she was not concerned with convincing her fellow lawmakers or even her own party, but rather focused on going directly to voters to galvanize support. "This is not a partisan issue, because there are Democrats who will get in the way of us saving ourselves," she said. "We encourage everyone here to look it up. I'm here not to convince my colleagues, but the electorate... If the electorate prioritizes it and overwhelmingly supports it, then we create the political room to pass it." She added, "What I'm tired of, is us worrying about the future of fossil fuels and not the future of fossil fuel workers. They wave this wand and they say it's going to cost a gazillion dollars and they sound like Dr. Evil. How about we fully fund the pensions of coal miners in West Virginia? How about we start by re-building Flint [Michigan]?"